This is the 100th post on Catalogue of Organisms! Yes, 100 entries have been made since I began my rise to become, to quote John Cameron Mitchell, the internationally ignored superstar you see barely standing before you today. So what led me to start blogging? Nothing more (or less) than the desire to write about taxonomy, systematics, evolution, and more taxonomy. Next year also happens to be the 250th anniversary of the official beginning of zoological nomenclature, with the publication of the 10th edition of Linnaeus' Systema Naturae (the botanists were a bit quicker off the mark, and they trace things back to Linnaeus' Species Plantarum of 1753). It therefore brings me great pleasure to unveil the first installment of Linnaeus' Legacy. Hopefully this will be a monthly review of recent posts on the subject of biodiversity past and present, the study of said biodiversity and the questions of how to understand, describe and communicate about it. Posts will be accepted on all aspects of taxonomy and systematics, from the esoteric (species concepts, classificatory principles) to the pragmatic (new discoveries in the world of systematics) to the didactic (communicating about taxonomy). Since he established the practice of binomial nomenclature (originally intended to be simply a short stand-in for much longer, more official-sounding names), this is indeed Carl Linnaeus' legacy, though I'm not certain he'd appreciate everything we're doing with it. Enjoy! Why is this all important? The annotated budak has a video for us on this very question. Rod Page of iPhylo looked up frogs, and came across the question of whether to accept electronic publication dates in deciding which name has priority. While not too far away, David Shorthouse of iSpiders wondered if taxonomy should be conducted more like software development. Malte Ebach and David Williams at Systematics and Biogeography take issue with the current use of the phrase "natural classification", garnering a response from John Wilkins at Evolving Thoughts. Aydin Örstan of Snail's Tales works on the eponymous gastropods, and he writes about identifying whether two snail species are hybridising. Craig McClain of Deep Sea News gives us an oddly disturbing looking new species of squid. Andrew Bleiman found the same toothy critter. If you've ever wondered where dentures end up if they're dropped down the loo (as apparently happens surprisingly often), this is probably where. Meanwhile fossil cephalopods are covered by Cameron McCormick at The Lord Geekington. Like all of us, he runs up against a bit of a wall when it comes to the question of just what is the correct plural for "octopus"? Kevin Z of The Other 95% gives us the fossil crustacean Yicaris dianensis. I had being going to write on this discovery when it was published, but Kevin beat me to it, and there didn't seem to be anything more I could say. Michael Barton of The Dispersal of Darwin reports on Charles Darwin's opinions of his own taxonomic research on barnacles. One cute story that I once heard was that one of Darwin's young daughters, being shown a friend's house, asked "but where does your daddy do his barnacles?" Doug Taron of Gossamer Tapestry read a description of a grasshopper written nearly 140 years ago, and was able to identify the species involved. Nuthatch of Bootstrap Analysis has identified her backyard wasps, and found more than she expected! Rick MacPherson of Malaria, Bed Bugs, Sea Lice and Sunsets runs a feature called "Moray Monday". Here's one of his recent offerings. Almost every post ever written by Darren Naish at Tetrapod Zoology would contend for inclusion here, but lately he's been bitten by the Anura bug (to the extent he seems to have considered renaming his site the "Frog Blog"). His recent posts on frog diversity are here, here and here. Matt Celesky of the Hairy Museum of Natural History has a penchant for Mesozoic reptiles. In A Wish for Coelophysis, he describes how one tiny little bone changed our understanding on how birds are glorified reptiles. And speaking of said glorified reptiles, GrrlScientist at Living the Scientific Life (Scientist, Interrupted) tells us about a new species of antwren from Brazil. It's purty. Patrick Belardo at The Hawk Owl's Nest has a history of the common name for Icterus gularis, one of the North American "orioles" (quotation marks because orioles proper are, of course, a completely different family of birds from South-East Asia). Jeremy Bruno at The Voltage Gate apparently has a double life as a World of Warcraft player, and has noticed more than one fellow player using biological names as titles. So of course, he's decided to find out just what the organisms these people have named themselves after are. The first entry: the small flycatcher Empidonax. Michael Ryan at Palaeoblog was hanging around in a similar corner of phylospace, announcing (among others) the new dinosaur Suzhousaurus megatherioides, a member of the truly oddball therizinosaurs. Elsewhere, the naming on the recently-discovered Futalognkosaurus dukei after a funding company led Neil of Microecos to mull on the history of naming taxa after benefactors and celebrities, while Julia at The Ethical Palaeontologist looks at the new hadrosaur Gryposaurus monumentensis. Brian Switek at Laelaps had a bit of trouble finding the correct name for the plains zebra, Equus burchelli. I mean, Equus quagga. Sorry, Equus antiquorum. Oh heck - I'll just quit while I'm ahead. Anne-Marie at Pondering Pikaia writes on the close relationship of colugos to primates. This isn't the first time this has been suggested - indeed, Arnason et al. (2002) went so far as to suggest colugos were more closely related to anthropoids (monkeys and apes) than prosimians were, but the idea didn't stick. Finally, Afarensis keeps an eye on the world of anthropology, including a weekly entry on Know Your Primate. Lepilemur mustelinus is his latest subject, including the disturbing fact that sportive lemurs, like rabbits, eat their own poop in order to gain maximum nutrition from their food. Now that all took longer than I expected. I hope you enjoyed the first edition of Linnaeus' Legacy. If anyone would like to help with future editions, or submit posts, get in touch! 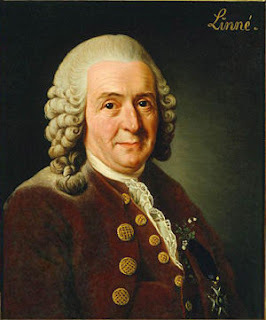 Picture of Linnaeus via Stranger Fruit. Three Domains tree from Palaeos. Image of Arthropleura by moonlight from Hairy Museum of Natural History. Arnason, U., J. A. Adegoke, K. Bodin, E. W. Born, Y. B. Esa, A. Gullberg, M. Nilsson, R. V. Short, X. Xu & A. Janke. 2002. 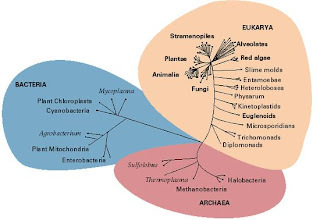 Mammalian mitogenomic relationships and the root of the eutherian tree. Proceedings of the National Academy of Sciences of the USA 99 (12): 8151-8156. Congratulations on your 100th post! I'm glad to see that you've started up the carnival as well (sorry I didn't get back to your e-mail right away; I was cut off from the internet most of the day yesterday). Thanks for linking to a post of mine, and congrats on your milestone! Hello, thanks for the mention, and congrats on your milestone. FYI, I'm at work on another mystery specimen. It's not an exact match for anything based on its ITS and LSU sequences. Morphologically, it looks like Phlebia cornea, but molecularly it's closer to Phlebia subochracea. It's looking very much like we have something new here, but more work needs to be done. If it's a new species, it will be named Phlebia strummerii in honor of the late lead singer/guitarist of The Clash. Keep up the good work & thanks for the link. Congrats! And thanks for including me among the heavy-hitters here, it's quite an honor. Thanks for including me! Cool idea for a carnival. Great concept Christopher! I will look forward to submitting in the future. Let me know if you need hosts.I can do mid-Dec., anytime in Feb., 1st of march or anytime in April and thereafter. I'll do what I can to increase the visibility of this carnival. You might want to email it to Bora, PZ and Greg Laden. They commonly highlight the carnivals going on and hits tend to pour in nicely. Hey, thanks so much for including one of my posts, I really appreciate it! Congrats on your 100th post, I really enjoy your blog and am looking forward to reading the next 100 entries! Congratulations on your 100th posting. I very much appreciate being included in your list. Good luck with the next 100 posts!